Super pumped to go on Saturday and Sunday. Trails are groomed and looks like some snow and decent weather coming our way. See you at the Quality Inn on Saturday between 8-9am. This rally is a two day event from Whitecourt to Swan Hills to Fox Creek. You can start at any of the locations. 350kms, which is a 10hr ride. Intermediate to Advanced riders only. Registration: Quality Inn Lounge 8:00am to 9:00am. 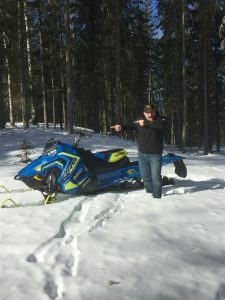 You must possess an Alberta Snowmobile Association Trail/Day Pass. $20 Registration fee. An ASA Waiver will be signed. All emergency contact information will be provided for each rider and we will provide information to the rider. We will also be selling 50/50 tickets for $5.00. Ride begins at 9:00am. Maps will be provided with registration. Riding from Whitecourt: 350 km. About 100km between communities. It is about a 6 hour ride day 1 and 4 hrs day 2. You should bring your own bag lunch for both days and no fuel will be available on the trail. We will ride to Swan Hills, fuel up and grab snacks/lunch. Then ride to Fox Creek where we will stay in a hotel for the evening (you are required to book your own room – most of the group has booked at the Best Western). Dinner plans are up to you. There is a secure compound to park your sled for the evening; however, it must be there between 3:00pm and 5:30pm. 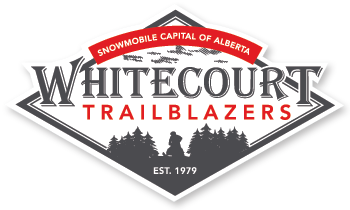 Sunday, we will then leave after 8:00am and arrive back in Whitecourt. A sweep will be following the group both Saturday and Sunday. Riding from other locations: Please look on the Golden Triangle Website for their information. If you are travelling from Fox Creek and Swan Hills and want to stay in Whitecourt, we are recommending the Microtel and the Holiday Inn as there is a secure compound close by. We are also recommending the Quality Inn as we have registration there and it is within walking distance to the compound. If you are using the compound, you must have your sled at the location between 3:00pm and 6:00pm. Evening dining is at your choosing (taxi service is sponsored by the Whitecourt Trailblazers/Golden Triangle). Sunday you can leave at 9:00am from the secure compound. Whitecourt – If you are riding through Whitecourt on the trail – Eagle River Casino is ideal as there is a Husky Gas Bar with snacks and light lunch items. If you are staying in the hotels downtown, there is a Flying J on the south side of Hwy 43 across from the Quality Inn or a 7-11 behind the IGA. Swan Hills – The trail goes into town where you will see Husky and Esso fuel stations. Fox Creek – Fuel is available at the Esso Gas station just off the trail. There will be contact numbers in the event your sled breaks down, we have runners available. Need emergency contact, we will provide that as well. You can ride in Whitecourt under the Town Bylaw between the hours of 7am and 10pm. Speed limit is 20km/hr. Please respect residents. Please review information specific at Swan Hills and Fox Creek on the Golden Triangle Website for accommodations or other information. 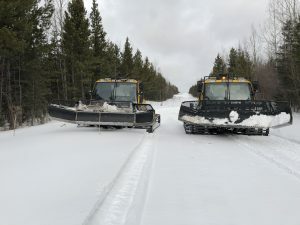 North-East and North-West Side: Groomed areas- Athabasca Barn Base to Virginia Hills Road via Chickadee Creek and Manweiler Trail, back to base on Gundy. Athabasca to Carson Cabin via Athabasca Lookout. Carson Trail to be completed. South Side:Groomed – Bessie, Goodwin, and Manweiler to Cabin and to the Athabasca River. All trails are in excellent condition. Please watch for Industry on the North and South trails. Watch for the sno-cats on trails at all times as they drag the trails at all hours on the weekends and weekdays. Thank all of our Check Point Groups for helping us out and for their extra effort to meet everyone on the trail. We had Riderz, 721 Hawk(Whitecourt Air Cadets), Whitecourt Woodlands Tourism, RCMP Whitecourt , Adrenaline Powersports Ltd and RPM Powersports Ltd. – THANKS!! Thank you to all of our volunteers for the Rally. A big thank you to all of our volunteers for everything you do throughout the year and for the rally. We were very pleased with the number of riders for the event this past weekend. The volunteers are the backbone of our club and without them we can’t host events.